We’ve been excited about Zootopia’s March 4th release since December, when we made Zootopia Activity Sheets like Zootopia character ornaments, gift tags and Zooflakes! We kicked off the new year with a fun, all-inclusive Zoo Year’s Eve Zootopia-Themed Party Pack! Save the date, parents! Zootopia opens in theatres everywhere March 4th, and we can hardly wait. 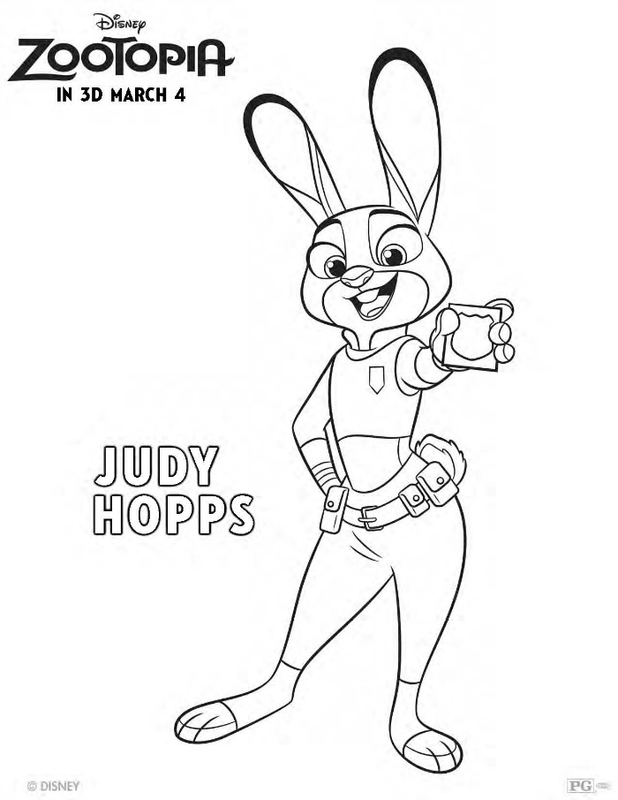 To help pass the time, we have three new Zootopia activity and coloring pages to share with you! In Zootopia, anyone can be anything — and Judy Hopps has taken the city’s motto to heart. Ever since she was a young bunny, Judy has wanted to be a police officer. However, the odds are against her. A bunny has never even dared to try to join the Zootopia Police Department. All of the cops in Zootopia are big animals like elephants, hippos and rhinos. Even so, Judy is the eternal optimist. Nick Wilde — a cynical fox — believes that we are what we are, and that’s all we’ll ever be. He isn’t afraid to tell Judy that her dream of becoming a real cop is never going to happen. As parents, don’t we want our kids to believe that anything is possible? When you see Zootopia in theatres with your kid, you will embark on a crazy journey with Judy and Nick who must learn to work together — in the face of stereotypes — to crack a major case within 48 hours, or Judy has to resign from the police force! Before you go, snuggle up with your kids and enjoy this clip of Judy Hopps Arriving in a metropolis designed by animals! Below this clip you’ll find our new Zootopia activity and coloring pages! 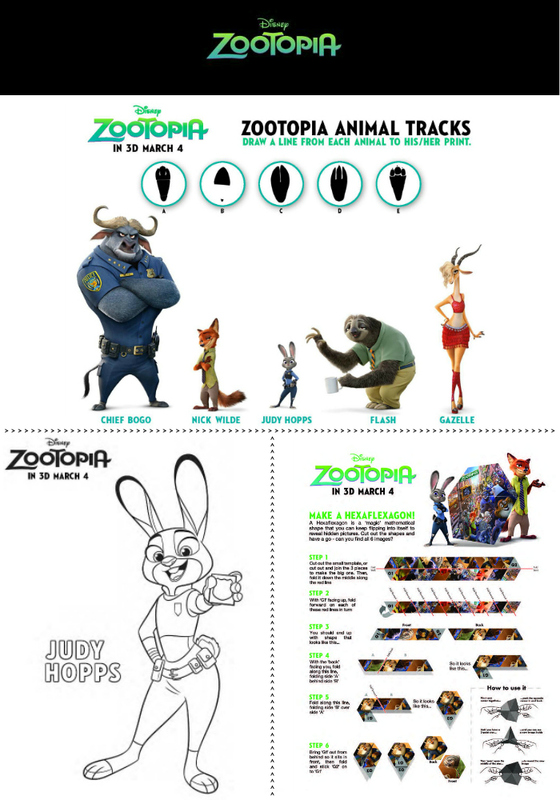 To download each Zootopia activity and coloring page, just click on each photo below! There are 64 unique species in Zootopia! 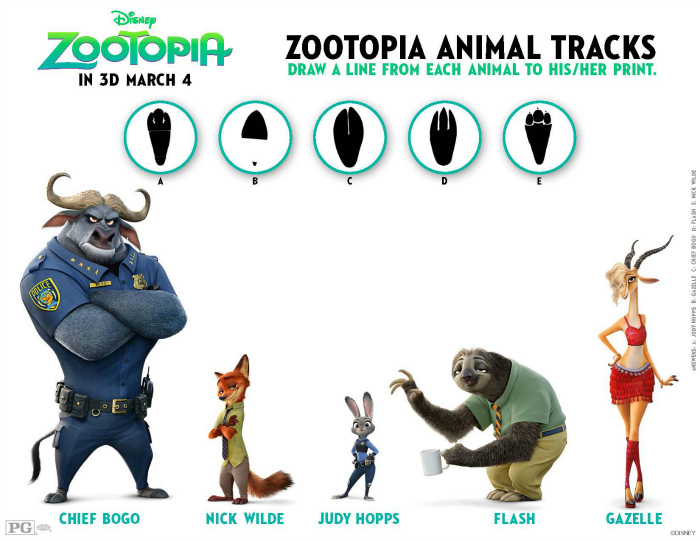 Can you match each of these Zootopia characters to his/her print? Judy doesn’t like bullies and stands up for the little guy! Judy believes that anyone can be anything. Color Judy’s police uniform! 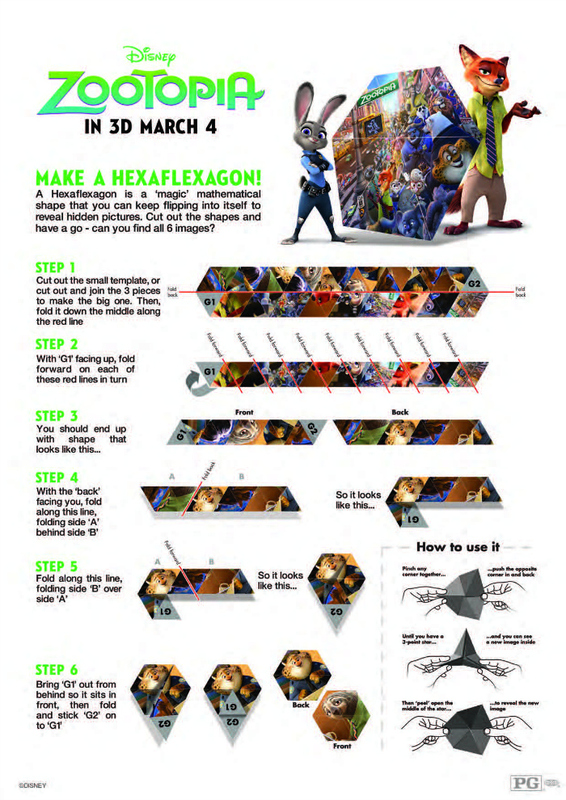 Try your hand at this ‘magic’ mathematical shape that you can keep flipping into itself to reveal hidden pictures from the movie Zootopia! Connect with Walt Disney Animation Studios on current and future projects!